So, it is officially springtime….But the temperatures have plumetted to winter ones. Still, being optimistic that the weather will improve, a lovely root of celeriac beckons and it is going to be céleri rémoulade for today’s lunch starter. This is a classic French crudités ( = raw vegetables) starter that can be enjoyed in all seasons, providing you can get the celeriac. Usually, the vegetables for crudités are crunchy and this one certainly is if you mix the mayonnaise into the celeriac at the last minute. It is nicer to make your own mayonnaise but if time is short a good quality one from the supermarket shelf will do. 1. Peel the celeriac and rub the lemon on all sides quickly to prevent it from going brown. 2. Chop and put the pieces in a food processor, using the fine grater. Whizz. 3. Put the contents in a large glass bowl and pour the lemon juice over the celeriac, making sure the juice permeates all the vegetable strands. 4. Season lightly with salt and pepper and add the rémoulade sauce and the capers. Mix thoroughly. Garnish with flatleaf parsley. A crisp chilled white wine goes well with this dish. After you have squeezed the lemon juice, quarter the lemon skin and coat the peeled celeriac with the quarters to prevent it from going brown. Beautiful fuschia in the sunshine were the inspiration for these healthy, refreshing and tasty verrines. Beetroot and tomato gave the colour nearest to the flower and the taste came from goatmilk yoghurt, garlic and fresh mint. These verrines can be served as an appetizer or a side dish. They are packed with vitamins and will not add inches to the waistline. 1. Whizz the beetroots with the garlic cloves and the mint leaves. Season with the salt. 2. Mix the yoghurt and fill the verrines. 3. Add the tomatoes and the basil leaves et voilà! An easy to make dessert, healthy but a little boozy. 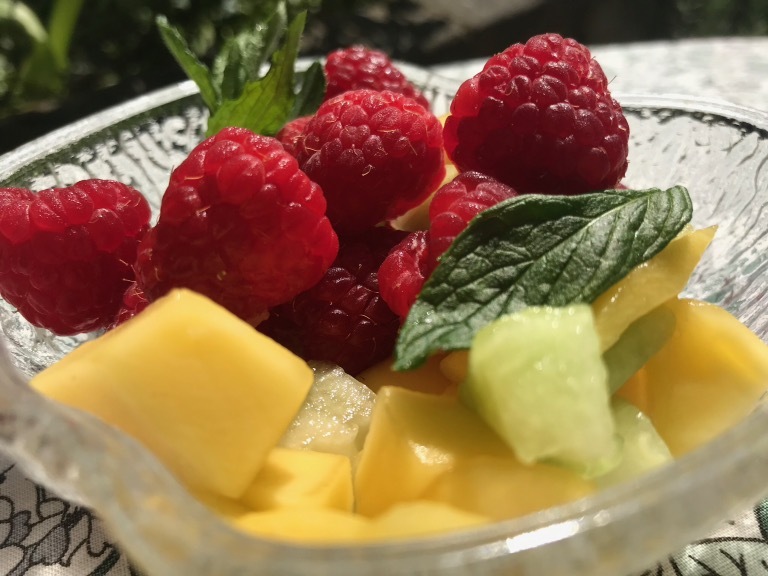 All you need is melon, mango, raspberries, rum, lemon juice and a little sugar syrup. Add a few fresh mint leaves. You don’t have to add the rum, of course, and can replace the sugar syrup with a little elderflower cordial. 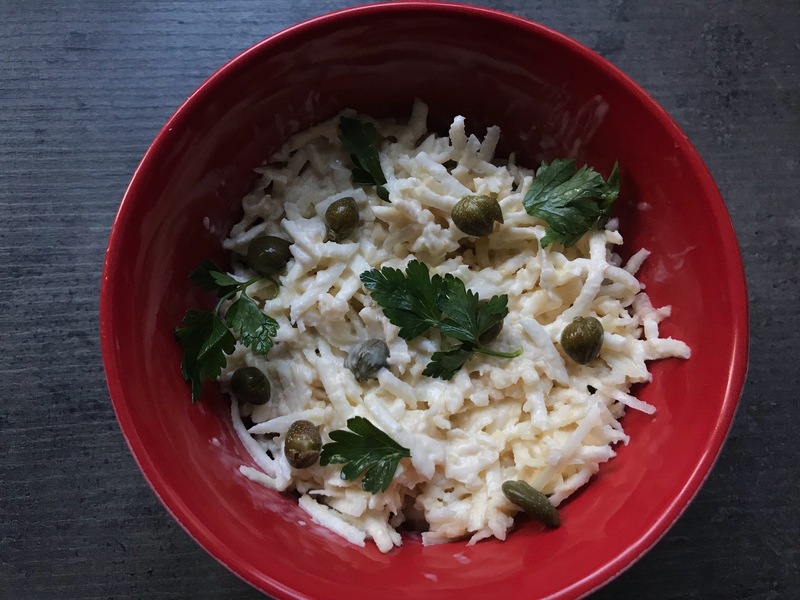 For those of you who have already looked at this blog, you will know that I am very fond of brocciu* ( ricotta) and of figatellu (Corsican liver sausage). I discovered recently a baker who makes country loaves with both the brocciu and the figatellu. The bread is then gently drizzled with Corsican honey. All this is surprising as the baker is not Corsican and the bakery is not in Corsica either. They simply specialise in a wide range of breads. A sampling of this delightful bread when it was just out of the oven took place on a very cold day, with snow falling heavily for a few hours; the conditions were perfect! The next door traiteur (delicatessen) provided tasty charcuterie and a bottle of red Burgundy completed an easy lunch. Perfect meal with little effort! Not a classic Sunday lunch maybe, this little salad is healthy, low in calories, easy to prepare and provides some much needed lighter food in January. It does not require much preparation and the Cromer crab has already been dressed by the fishmonger. The large crab serves 2 people easily, but depending on your appetite, you may wish to serve one per person. Slice the avocado and drizzle with some lemon juice immediately to avoid oxidation. Prepare the vinaigrette in a small mixing bowl by using 1 teaspoon Dijon mustard, adding 2 teaspoons red wine vinegar and 3 tablespoons olive oil. Stir well and reserve. Dress a serving plate with all the vegetables, pour the vinaigrette on top, place the crab in the centre. Tip: I tend to keep a jar of mustard when it is almost empty and add the vinegar and oil directly in it. This provides instant vinaigrette and keeps very well in a cupboard. Provence is a land of many traditions and this one refers to what happens on the 12th Day after Christmas, which is the Epiphany. We celebrate the Epiphany with a special gâteau, in fact a brioche infused with orange flower water, covered with sugar grains and glacé fruit. There is also a golden cardboard crown (couronne) which is worn by the King. The origin of this gâteau, or couronne (because of its shape) precedes the origin of the galette I mentioned in my previous post of 7 January. The three Kings have a prominent place in the Christmas tradition in Provence. Their santons (clay figurines) are an important part of the crèche (crib) and they are on full display on the 6th January. Before that date, they are placed as far away as possible from the crib and they are not visible. They travel discreetly each day to finally arrive and offer their presents to the baby Jesus. To symbolise the offerings, one small porcelain santon and one dried broad bean are hidden in the gâteau. If there are children present, which is often the case as the celebration starts with a family one, the youngest hides under the table and says which portion of the cake is for whom. This prevents people from choosing which glacé fruit they will have and whether or not they will get the sujet (figurine) or the fève (broad bean). This is important because the recipient of the sujet becomes the Reine (the Queen) and has to buy the next bottle of champagne and the recipient of the fève becomes the Roi (King) and has to buy the next cake. This way, we ensure a whole month of celebrations, not only in the family, but with friends and colleagues as well. Normally, the Gâteaux des Rois are eaten on Sundays, at tea time, but people please themselves as to when and where they eat them. Most pâtisseries also sell smaller gâteaux des Rois which do not contain sujets or fèves but which can be consumed for breakfast with coffee. As they are very tasty brioches, they go well with coffee.